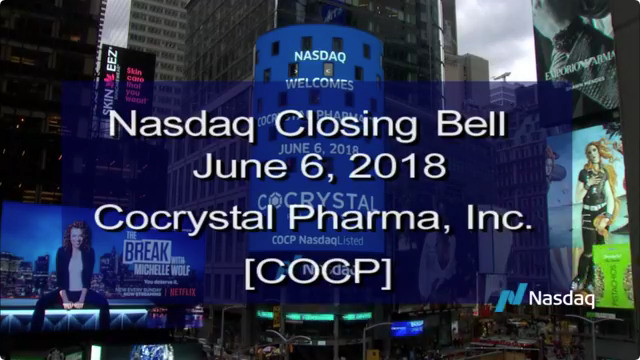 BOTHELL, WA, Nov. 12, 2018 (GLOBE NEWSWIRE) -- Cocrystal Pharma, Inc. (NASDAQ: COCP), (“Cocrystal” or the “Company”), a clinical stage biotechnology company discovering and developing novel antiviral therapeutics that target the replication machinery of hepatitis viruses, influenza viruses and noroviruses, announced today its financial results for the quarter ended September 30, 2018 and provided a corporate update. Announced Clinical Trial Agreement for investigator-initiated Phase 2a study in Hong Kong of CC-31244 in a novel combination therapy for ultra-short treatment of hepatitis C (HepC). Completed patient enrollment in Phase 2a study evaluating CC-31244 for ultra-short treatment of HepC. CC-31244, the Company’s lead product in development for HepC, is an investigational, oral, potent, broad-spectrum replication inhibitor called a non-nucleoside inhibitor (NNI). It has a high barrier to drug resistance designed and developed using the Company's proprietary structure-based drug discovery platform. It is active against HCV genotypes 1-6 with low level cytotoxicity in multiple cell types. CC-31244 is currently being evaluated in an ongoing Phase 2a clinical study for the ultra-short treatment of HCV-infected individuals. The Phase 2a open-label study is designed to evaluate the safety, tolerability and preliminary efficacy of CC-31244 with Epclusa®. Enrolled subjects self-administered orally 400 mg of CC-31244 daily and a fixed dose of Epclusa daily for 14 days. After 14 days the subjects continued daily treatment for another 4 weeks on Epclusa alone. Subjects will be followed up until 24 weeks after the last dose of Epclusa to determine if they have achieved a sustained virologic response (SVR). Primary and secondary efficacy endpoints are SVR at 12 weeks post-treatment (SVR12) and at 24 weeks post-treatment (SVR24), respectively. Additionally, the Company recently announced the signing of a Clinical Trial Agreement for an investigator-initiated study with the Humanity & Health Research Centre, Hong Kong, PR China. Under the Clinical Trial Agreement, the Phase 2a study of CC-31244 for the treatment of HepC will be sponsored and conducted by the Humanity & Health Research Centre, Hong Kong under the guidance of Dr. George Lau, MBBS (HKU), M.D. (HKU), FRCP (Edin, Lond), FHKAM (Med), FHKCP, FAASLD, Chairman of Humanity and Health Medical Centre, Hong Kong. As part of the agreement, Cocrystal will provide CC-31244. The Hong Kong Phase 2a open-label study for the treatment of HepC will evaluate the safety, tolerability and preliminary efficacy of CC-31244 in combination with Sofosbuvir and Daclatasvir with or without a protease inhibitor. Sixteen patients will be enrolled in the Phase 2a study. This trial differs from the current Phase 2a trial Cocrystal is conducting in that testing will include for the first time a protease inhibitor. Announce interim topline results from CC-31244 U.S. Phase 2a study in December 2018. Commence Hong Kong Phase 2a open-label study of CC-31244. CC-42344, the Company’s lead molecule, binds to a highly conserved PB2 site of influenza polymerase complex and exhibits a novel mechanism of action which inhibits replication. CC-42344 has shown excellent antiviral activity against influenza A strains, including avian pandemic strains and Tamiflu® resistant strains, and shows a favorable pharmacokinetic and safety profile. CC-42344 is currently being evaluated in preclinical IND-enabling studies for the treatment of influenza. Further, the Company has identified molecules which have activity against both strain A and Strain B. Several of these have potencies approaching single digit nanomolar. Cocrystal is comparing them with its influenza A inhibitor, CC-42344 and will determine which program(s) to take forward. The Company is considering oral, intravenous and inhaled routes of delivery. Initiate Phase 1 study evaluating CC-42344 for the treatment of influenza in 2019. For the three and nine months ended September 30, 2018, the Company reported a net loss of approximately $1,868,000 and $4,762,000 compared to a net loss of approximately $2,260,000 and $5,810,000 for the same periods in 2017. Total research and development expenses were approximately $1,467,000 for the three months ended September 30, 2018, compared with $1,393,000 for the three months ended September 30, 2017. The increase of $74,000, or 5.3%, was due to the timing of Phase 2a clinical trials costs in 2018. Total research and development expenses for the nine months ended September 30, 2018 were $3,464,000, compared with $4,718,000 for the nine months ended September 30, 2017. The decrease of $1,254,000 or 26.6%, was the result of reduced cost and timing of clinical trials activity. For the nine months ended September 30, 2018, cash provided by financing activities totaled $8,869,000. Our 2018 financing activities included $7,684,000 net proceeds from the issuance of common stock and warrants, $1,000,000 in proceeds from the issuance of convertible notes and $185,000 in proceeds from the exercise of stock options. Net cash provided by financing activities for the nine months ended September 30, 2017 amounted to approximately $3,000,000 in proceeds from issuance of common stock and $80,000 in proceeds from the exercise of stock options. This press release contains forward-looking statements within the meaning of the Private Securities Litigation Reform Act of 1995, including our expectations regarding the timing for the initiation and future progress of the Hong Kong Phase 2a study and influenza A study. The words "believe," "may," "estimate," "continue," "anticipate," "intend," "should," "plan," "could," "target," "potential," "is likely," "will," "expect" and similar expressions, as they relate to us, are intended to identify forward-looking statements. We have based these forward-looking statements largely on our current expectations and projections about future events. Some or all of the events anticipated by these forward-looking statements may not occur. Important factors that could cause actual results to differ from those in the forward-looking statements include the availability of products manufactured by third parties, receipt of regulatory approvals and the ability of the Hong Kong clinical research organization and the clinical research organization we contract with for the influenza A study to recruit subjects. Further information on our risk factors is contained in our filings with the SEC, including our Prospectus Supplement dated April 30, 2018, and our Annual Report on Form 10-K for the year ended December 31, 2017. Any forward-looking statement made by us herein speaks only as of the date on which it is made. Factors or events that could cause our actual results to differ may emerge from time to time, and it is not possible for us to predict all of them. We undertake no obligation to publicly update any forward-looking statement, whether as a result of new information, future developments or otherwise, except as may be required by law.